I attended the B.C. Vocational Institute Farrier Science Program in 1975 and studied under the direction of Bob Marshall, a Master Farrier just off the boat from Lancashire where he had learned the trade from his father, also a Master Farrier. In the U.K. the farrier trade is highly regulated by the Worshipful Company of Farriers guild and other regulatory bodies. It is the W.C.F. that evaluates and approves farriers for licensing. In Canada no regulations effectively govern the activities of or provide licensing for farriers. Farrier school with Bob Marshall was a truly satisfying learning experience as well as a great adventure. I couldn't have hoped for a better teacher from whom to learn the basics of this ancient and honorable trade. Combined with his profound knowledge of the farrier's craft, Bob is the kind of colorful horseman that only the British Isles can produce. I count the twelve weeks I spent as his student one of the most rewarding and memorable periods of my life. Thanks, Bob! Bob taught us "hot shoeing" as that was the style he was accustomed to. Near the end of our semester he gave us a course in cold shoeing at the request of the school. The term "hot shoeing" has a couple of connotations: it can refer to the process of heating a steel bar in a forge to a red heat and making a shoe on the anvil; it can also refer to the practice of applying a heated shoe to the bottom of a horse's foot to achieve a complete joining of the two surfaces. Cold shoeing is the method of shaping and applying a ready-made shoe without heat, achieving the marriage of the two surfaces by careful leveling of the shoe with hammer blows, and of the hoof with precise strokes of the rasp. Cold shoeing is practical with smaller feet and lightweight standard shoes. 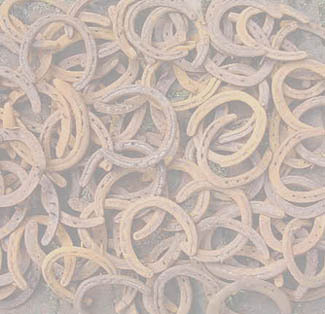 Larger horses, like heavy hunters and draught breeds, usually require "hot shoeing"—in both senses of the term. Both techniques require a great deal of skill acquired through study and practice. During the intervening years I have had considerable experience with various types of shoeing. One of the more interesting of these includes shoeing driving horses for street work. 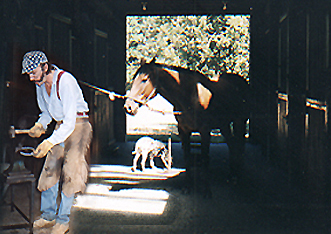 Another is shoeing polo ponies (for play!). Of course I have shod and continue to shoe ordinary pleasure horses as well, from ponies to draught horses. My client list includes veterinarians, equestrian judges, professional riders, and mounted police, as well as just plain ordinary horse lovers like myself. Let me know if you would like a reference from any of them. I would be delighted to discuss the shoeing of your horses. I also invite your questions. Got a shoeing problem? Let's chat about it! I get more inquiries these days about "barefoot trims," which presumably means trimming a horse in such a way that it can manage a workload without shoes. There is nothing really new about this idea as horse owners having been trying it since ancient times. Success is determined by conformation and the natural degree of hardness in the subject equine's foot, how heavy the workload, and how rough the ground. There is no magic bullet to make this work for you in every case, so if it doesn't, don't blame your farrier. He or she is just trying to make you happy and make a living. Having said that, I had a horse when I was a kid (definitely ancient times!) that had feet like a mule. 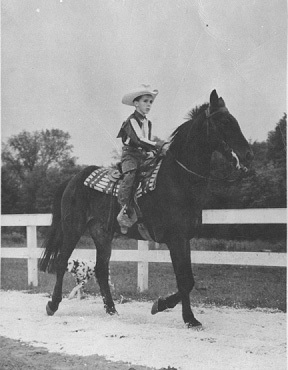 I rode him everywhere and never put a shoe on him, nor was he ever lame. We all need to save a bit of money nowadays but, the point is, it's either in the genes or it's not.